Preparations are underway for the iPhone 3G launch this Friday at AT&T and Apple stores nationwide. 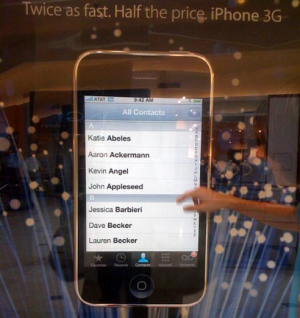 Gizmodo posts photos of oversized iPhone 3G store displays (pictured above) that demonstrate the functionality of the iPhone. Apple had similar units on display for the original iPhone launch, but these have been updated to reflect the black back case of the iPhone 3G. The leaked sales memo also details that employees are to download apps from the App Store on the morning of July 11th and that the phones are to be activated on July 10th. So, while, the demo units may be in AT&T stores tomorrow, they may not be available for public use until launch day. Apple held their retail meeting last night, and details have been slow to trickle out. We've heard that more details will be available throughout the week but several employees seem to believe that they will open at 8am to mirror AT&T's launch time. (Apple apparently did not dictate an exact time so it may be left up to the discretion of the individual Apple stores.) As expected, iPhones will be activated in-store and must be paid for by check, credit card or gift card. Cash may be used to purchase gift cards, however, which in turn could be used to buy the iPhone. Credit checks, of course, will be performed at time of sale. A few of these details are also corroborated at Macenstein. Update: We've heard conflicting tidbits about existing AT&T non-iPhone customers. To avoid confusion and delays, existing AT&T customers who do not currently own an iPhone should probably go an AT&T store (not an Apple Retail Store) on launch day to upgrade to the iPhone 3G. We'll post more updates as we hear them.